Though the Treaty of Versailles was signed on June 28, 1919, November 11th remained in the public imagination as the date that marked the end of the Great War. In November 1918, U.S. President Woodrow Wilson proclaimed November 11 as the first commemoration of Armistice Day. The day's observation included parades and public gatherings, as well as a brief pause in business activities at 11 a.m. On November 11, 1921, an unidentified American soldier killed in the war was buried at Arlington National Cemetery in Washington, D.C.; the U.S. Congress had declared the day a legal federal holiday in honor of all those who participated in the war. On the same day, unidentified soldiers were laid to rest at Westminster Abbey in London and at the Arc de Triomphe in Paris. On June 4, 1926, Congress passed a resolution that the "recurring anniversary of [November 11, 1918] should be commemorated with thanksgiving and prayer and exercises designed to perpetuate peace through good will and mutual understanding between nations" and that the president should issue an annual proclamation calling for the observance of Armistice Day. By that time, 27 state legislatures had made November 11 a legal holiday. An act approved May 13, 1938 made November 11 a legal Federal holiday, "dedicated to the cause of world peace and to be hereafter celebrated and known as 'Armistice Day.'" In actuality, there are no U.S. national holidays because the states retain the right to designate their own, and the government can only designate holidays for federal employees and for the District of Columbia. In practice, however, states almost always follow the federal lead. The American effort during World War II (1941-1945) saw the greatest mobilization of the U.S. Army, Navy, Marines and Air Force in the nation's history (more than 16 million people); some 5.7 million more served in the Korean War (1950 to 1953). In 1954, after lobbying efforts by veterans' service organizations, the 83rd U.S. Congress amended the 1938 act that had made Armistice Day a holiday, striking the word "Armistice" in favor of "Veterans." President Dwight D. Eisenhower signed the legislation on June 1, 1954. From then on, November 11th became a day to honor American veterans of all wars. The next development in the story of Veterans Day unfolded in 1968, when Congress passed the Uniform Holidays Bill, which sought to ensure three-day weekends for federal employees—and encourage tourism and travel—by celebrating four national holidays (Washington's Birthday, Memorial Day, Veterans Day and Columbus Day) on Mondays. The observation of Veterans Day was set as the fourth Monday in October. The first Veterans Day under the new law was Monday, October 25, 1971; confusion ensued, as many states disapproved of this change, and continued to observe the holiday on its original date. In 1975, after it became evident that the actual date of Veterans Day carried historical and patriotic significance to many Americans, President Gerald R. Ford signed a new law returning the observation of Veterans Day to November 11th beginning in 1978. If November 11th falls on a Saturday or Sunday, the federal government observes the holiday on the previous Friday or following Monday, respectively. 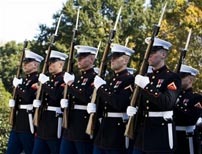 In the United States, an official wreath-laying ceremony is held each Veterans Day at the Tomb of the Unknowns in Arlington National Cemetery, while parades and other celebrations are held in states around the country. Veterans Day is not to be confused with Memorial Day—a common misunderstanding, according to the U.S. Department of Veterans Affairs. Memorial Day (the fourth Monday in May) honors American service members who died in service to their country or as a result of injuries incurred during battle, while Veterans Day pays tribute to all American veterans—living or dead—but especially gives thanks to living veterans who served their country honorably during war or peacetime.